From my point of view, this approach does feel unfair – and ineffective. In this two-part blog series, I’ll start by exploring some ideas for responding to what seems like unfair feedback from a supervisor, and in part two I’ll talk about how I think a supervisor can give feedback more effectively. In order to prepare for a conversation with someone who has more power within an organization, you must first start by managing your emotions and examining your thoughts. When you acknowledge your own feelings, it can take some of the power out of the often-overwhelming emotions of fear, uncertainty, and anger that normally result from being treated in a way that you feel is unfair. How important is it to have a conversation about the feedback? Why? What do you hope to accomplish by talking about it? What if you ignore it? Imagine your supervisor is operating with good intentions. What might those be? What are some positive changes your supervisor might want to see come from the feedback? If there was an element of truth in this feedback, what would it mean for you? Is there anything you can acknowledge or take responsibility for? What might be missing in your supervisor’s view of things that might change their story? What would you like to be different going forward? These questions will help you master your emotions and prepare for a possible conversation with your supervisor. Once you have asked yourself these questions, invite your supervisor to have a conversation with you. You’ll want to provide them with a compelling and positive reason to have the conversation. Your answers to the questions, “What are some positive changes your supervisor might want to see come from the feedback?” and “What do you hope to accomplish by talking about it?” will help you think this through. The point is to come up with a compelling and mutual purpose for the conversation. Taking an honest look at negative feedback usually provides you with opportunities for growth – even if the way it was delivered felt unfair. Listening is one of the most powerful tools for helping a conversation like this go well. When someone is truly listened to, it is disarming for them, and it prepares them to listen to you. Consider beginning the conversation by asking your supervisor to describe their hopes for the working relationship or for your work. Then listen. Rather than preparing to argue, tell them what you hear them saying and ask if there is more. If there isn’t, thank them for sharing. Once your supervisor feels heard, ask them if you can add to what they have said and share some of your perspectives. Describe your own positive intentions and your disappointment that these have not come through. Let them know that receiving the feedback has been hard and that you have been considering it seriously. If some key things are missing from your supervisor’s story, ask if you can add some details or perspective – do this in the spirit of being helpful, not defensive. Your conversation should finish with a plan for going forward – talk with your supervisor about what you can do differently based on their feedback. If you are unsure about what to do, say so, and ask them to work with you to figure that out. Talking with my friend, one of the things that was hardest was hearing about events in the letter that he did not specifically remember. He may want to ask the supervisor how they can get to the place where feedback is given more immediately. Conclude by thanking your supervisor for taking the time to have the conversation with you. Let them know you are open to further conversations if and when they are needed. Whenever we receive feedback, our instincts for self-preservation kick in. This often leads to feeling defensive, which shuts down our ability to find positive elements in the feedback. In order to work with critique or what we perceive as unfair feedback, we have to start by becoming calm and examining our thoughts. This helps us begin a mutual conversation with the person who gave the feedback – one that they are more likely to engage with in a positive way. When we prepare to listen first, this opens the door to being heard by our supervisor. Concluding with a focus on a positive future helps set the stage for better conversations moving forward. 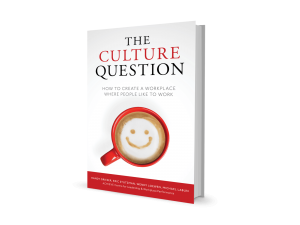 Eric Stutzman is a co-author from ACHIEVE’s new book, The Culture Question: How to Create a Workplace Where People Like to Work. The book is available now on our website. To receive notification of a new blog posting, subscribe to our mailing list or follow us on Facebook, Twitter and LinkedIn.